Presstek, Inc., a leading supplier of digital offset printing solutions to the printing and communications industries, today announced that Wausau Container, a folding carton converter specializing in production of high quality folding cartons in small lot sizes, has added a Presstek 75DI digital offset press to its production portfolio. The company has 65,000 square feet of manufacturing space, and offsite materials storage of 30,000 square feet. Wausau Container generates about $20 million annually with about 50 employees. The Presstek 75DI is a highly automated 31” digital offset press that is available in 4- to 10-color configurations. It has a full range of productivity enhancing options, including an inline aqueous coater. The 75DI features support for 300 lpi and FM screening, the ability to go from digital file to printed sheet in six minutes, and a small environmental footprint. 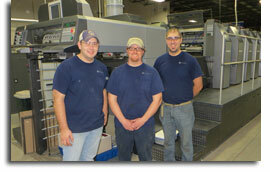 The press prints up to 16,000 sheets per hour.